Marvelous Midos Machine 4 is Here! After a twenty five year hiatus, some of the best loved characters in Jewish children's music have been resurrected with the release of the fourth installment in the Marvelous Midos Machine album series. Created by the venerable Abie Rotenberg, whose poignant lyrics and classic compositions have inspired countless music lovers for decades, the Marvelous Midos Machine used a memorable cast of characters including Shnooky and Shlumpy Shapiro, Dr. Midos, Dizzy and of course the Marvelous Midos Machine itself, to educate children about good midos in an lighthearted but meaningful way. 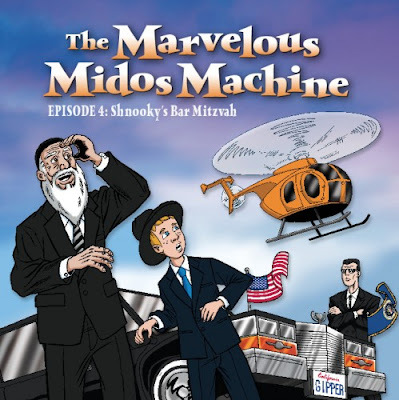 Rotenberg partnered with Moshe Yess, a"h, on Up, Up and Away, the first episode of the Marvelous Midos Machine and with Rabbi Shmuel Klein, the voice of Dr. Midos, on the episode three, titled Does Anybody Know What Time It Is? "I never thought there would be another episode of the Marvelous Midos Machine," Abie Rotenberg told VIN News. "The original albums were created when my own children were small and now that the grandchildren have come along, new ideas and new material came up. I think the passing of Moshe Yess was also a catalyst for this album and there is a tribute to him on the inside cover." Episode four of the Marvelous Midos Machine, titled Shnooky's Bar Mitzvah, takes place in 1988, picking up just one week after the end of episode three and explores new ground including exercising patience, forgoing an opportunity that is rightfully yours for the sake of another and enthusiasm. In keeping with its tradition of conveying lessons via quality music, Shnooky's Bar Mitzvah features catchy songs, trademark Abie Rotenberg lyrics and guest appearances by Baruch Levine and Shlomo Simcha. Several of the Rotenberg grandchildren are featured on the album as well. In an exclusive VIN News interview with Yossi Zweig, Abie Rotenberg discusses the origins of the Marvelous Midos Machine, his all new album and the possibility of future episodes in this iconic series.